When we baptize people it tells me that life change is happening in the person; it also tells me that people are giving their lives to Christ! When I read the Bible I see that baptism is something that always follows conversion; the person surrendering their life to Christ. When Jesus was preparing to return to heaven He leaves us, the church, with a pretty heavy job description. Its not a four page job description with hours that we have to work; but its a good reminder of what we need to do as Christians. Go read Matthew 28:18-20 for that command of Jesus. There is a reason its called "The Great Commission" and not "The Great Suggestion". I have taken 5 quarters of Greek now (which means I'm good enough to get by; kinda like my Spanish) and when I read in the Greek I keep seeing this word "baptizo" for baptism. 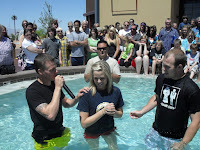 Baptizo means a baptism by immersion; that is why we use the pool to baptize people. Now, lets say that someone is in the hospital and has given their life to Christ and would like to be baptized. We would baptize that person with water but not having the ability for full immersion would be suitable for the situation. 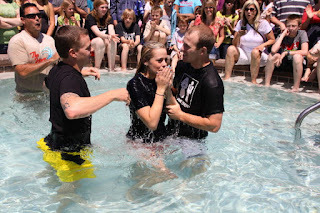 4) When someone gets baptized they are saying "I'm changing for Jesus"
This weekend we baptized a handful of high school students and one of them, Ally Davis, shared with me a few days before she was baptized that she needed to do because this was her next step in her walk with Christ. 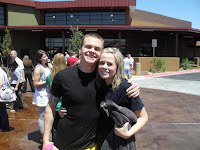 I love it when people are convicted by the Holy Spirit and then obey that conviction which leads to life change. 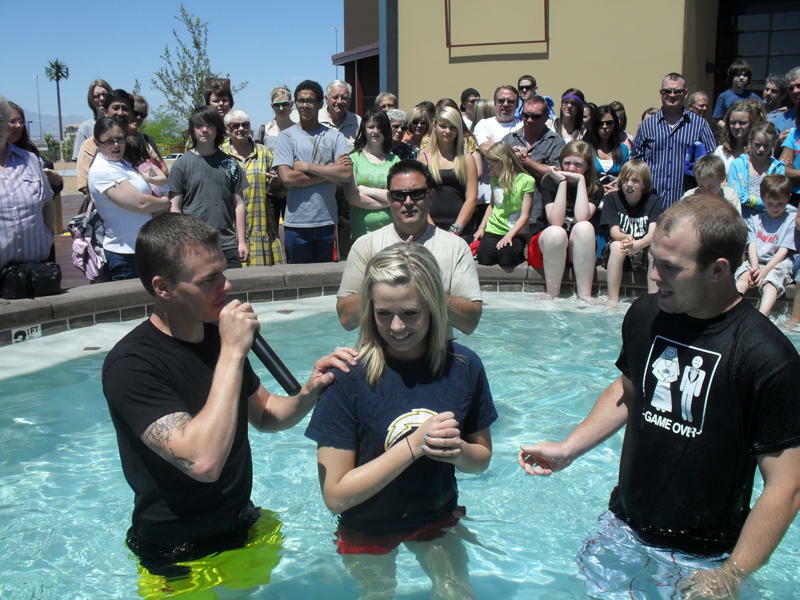 Here are just a few thoughts on baptism and why I am glad to be a part of a church that baptizes! So this week Leah had her one month check up; it was really her one month and a week check-up but who's counting? Leah is growing big and strong, she is learning to sleep more during the night and her and Sophie totally love each other!!! This week Jacob Dunne shared his story at Explode; more evidence of how God is still changing lives! Now I know that many thoughts tend to go through people's minds when they see tattoo's and I totally understand that I am a pastor who has a number of tattoos. I was talking with my tattoo artist about that and he told me that people don't believe him when he says that he tattoos a pastor (my tattoo artist is the coolest guy). The story behind this one comes from the account in Daniel 10:12-15 where Michael, one of the angels, helps the man who is speaking to Daniel. I don't believe in praying to angels but I do see from this account that angles will work on our behalf. I think the bottom line on this tattoo is that it is a reminder for me to pray. I don't know about you but I am very prone to wonder and go my own way. This tattoo is a reminder to me, daily, that prayer works and that I need to be in prayer. If you notice on the angels leg there is a demon who is trying to bring him down; there are things in life that will try to bring us down but I find when I am connected to God in prayer life seems to be a little bit more comfortable and easy to bear. Last night we started a new series in our High School Ministry called: "A Changed Life". This week Kalina Rock shares her story on how God has grabbed her heart and changed her life. This week is our Annual Student Ministry Garage Sale! This garage sale has helped us for the last eight years to off-set the cost of summer camp and allow students to reduce the price so they can attend. This year will be no different! So I'm pretty sure that I took this when Leah was 21 days old... she may have been 23 days old (that is what lack of sleep does to you). Tomorrow is Easter Sunday. 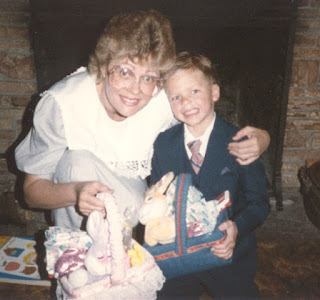 Now when I was a kid Easter was all about getting dressed up in a little suit that was fairly uncomfortable, going to Sunrise Service with my mom and then eating candy. My sister and I would find the eggs, then re-hide the eggs, then hide them again until they were pretty much uneatable. So now that I am a man and have my own family I need to figure out what about Easter is going to be important to us. Will we invite our neighbors to Church tomorrow? You bet! We're going to do these things because they are important; yes it is important to eat candy (someone has to keep the dentist in business). This Sunday, tomorrow April 4th, I'm teaching at Church about the resurrection of Christ. The more I'm studying this topic from 1 Corinthians 15 I am seeing the need to make sure I live daily for the resurrection. This Easter Sunday will be extremely important for my family because I want to live for the resurrection and it helps me to do that with a group of people that I love and want to do life with. Now maybe you have that group of people in your life already; please keep going to that church and dive into that. If you don't already have it will you find a place where you learn about God in a way that makes sense to you and challenges you to grow? Easter is important for so many reasons, more than I can share in this quick post. If you need a place to go on Easter I hope to see you at South Hills Sunday April 4th @ 9am or 11am!